In the arid Southwest, roughly 90 percent of the region’s rainfall evaporates, leaving relatively little water to fill streams and reservoirs or soak into the ground. Predicting this evaporation, and its responses to changes in land use, is essential to managing precious water resources. Arizona State University scientists Ted Bohn and Enrique Vivoni, of the School of Earth and Space Exploration, discuss a new technique in the journal Water Resources Research, which uses a combination of satellite imagery, field observations and models to estimate evapotranspiration - evaporation from soils and from plant transpiration. Evapotranspiration is an important component of the hydrological cycle and a major contributor to downwind rainfall. Bohn and Vivoni used a well-established model to study evapotranspiration in southwestern U.S. and northwestern Mexico, but modified it to account for soil evaporation, irrigated agriculture, and the seasonal variability of the land surface. An important difference from previous studies was the inclusion of irrigated agriculture in the model. The study derived seasonal changes in irrigated areas and vegetation greenness from NASA’s Moderate Resolution Imaging Spectroradiometer (MODIS), a key instrument aboard the Terra and Aqua satellites, which view the entire Earth’s surface four times per day. The scientists then compared field observations with simulated patterns of evapotranspiration. 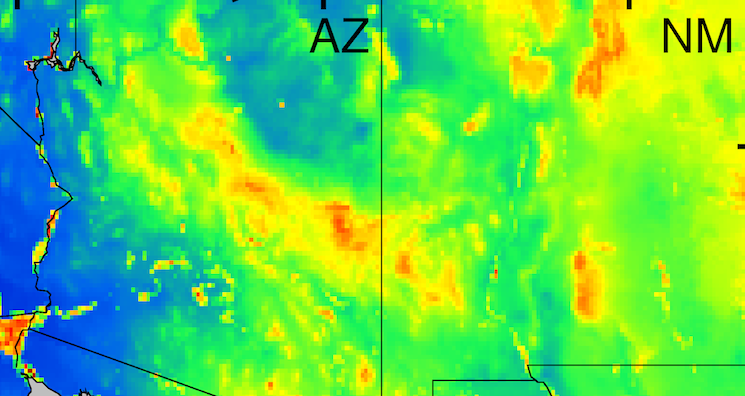 In doing so, they discovered that different ecosystems vary dramatically in the timing of evapotranspiration in response to summer monsoon rains. Desert shrub lands, for example, produce their peak evapotranspiration shortly after monsoon rains begin, while mountain forests are slower to peak and continue evapo-transpiring well into the autumn. In contrast, evapotranspiration from irrigated agriculture has little relationship with rainfall, and exhibits two peaks per year, during the winter and summer cropping seasons. These observed differences in peaks show that expansion or reduction of agriculture can dramatically change the timing and amount of local evapotranspiration, with potential effects on rainfall. A major benefit of the modified model used for this study is a better understanding of our water resources, and how they respond to changes in land use. “It will allow not only for more accurate climate and weather forecasts, but also for government agencies to plan better for anticipated changes in climate,” says Bohn. Top image: Arizona and New Mexico from the full figure shown as inset right. This displays the average annual evapotranspiration from the North American Monsoon region, 2000-2012.